Posted on July 17, 2016 by Sarah S.
What do you think of when you hear the word “entrepreneur”? A young man in a hoodie hunched over a computer, perhaps? A graying–but young at heart–millionaire venture capitalist, maybe? Whatever you envision, I bet you didn’t picture three young women from Simon Business School trying to end food deserts in upstate New York. We’re not your average entrepreneurs; we’re social entrepreneurs. Trying to solve social problems through business is tough. Launching a start up is difficult even if profit is your main motivator, but when you add in a mission for social impact, the challenge becomes that much trickier. This is compounded with skepticism from many sides: those who believe that companies have no business trying to do more than increase shareholder return and those who are hesitant to trust for-profit businesses to handle today’s most pressing issues. 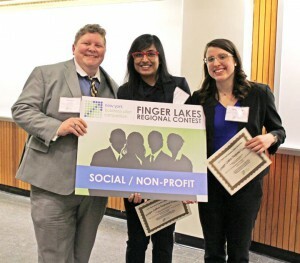 at Cook, Fahria Omar, and Sarah Spoto celebrate their Finger Lakes Regional win of the New York Business Plan Competition. Fahria Omar, Kat Cook, and myself launched Oasis Foods as part of Professor Michael Wohl’s Urban Entrepreneurship class. For the class, we were given this daunting task: end food deserts in Rochester, New York. Soon we had an idea for a frozen pre-prepared meal company that served its healthy products straight to consumers via vending machines. We want to give people access to healthy food where there are very few choices besides convenience stores and fast food. After six weeks of work that extended far beyond spreadsheets and formulas (think: cold calls, food pantry tours, and chats with City representatives), we presented our final project. The course might have concluded, but it was only the beginning for Oasis Foods. We applied for our first business plan competition. And failed. So we tried again. And again. We eventually got the break we were looking for: a chance to present at the Finger Lakes Regional Contest of the New York Business Plan Competition in Geneseo. There have only been a few other times in my life when I was as nervous as I felt while we were waiting for our results from that competition. 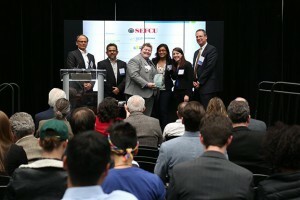 Oasis Foods won $10,000 in seed money for taking 1st place in the Social Entrepreneurship/ Non Profit track of the New York Business Plan Competition. Ultimately, the hard work paid off, and we made it to the final round of the New York Business Plan Competition in Syracuse. That was a whole new ball game. We worked feverishly to prepare, including one marathon 12-hour meeting, which took place after I had literally run a half marathon that morning. We couldn’t pull off those long nights if our team wasn’t a good fit. Fahria is creative, innovative, and the best relationship manager of the group. Kat is all about the operations and logistics, not to mention keeping us all sane with her humor. Launching a start-up is like no other experience. You can’t accomplish it simply by going to class. You need to step out into the world and solve a problem that really matters. When Oasis Foods was announced as the winner of the Social Entrepreneurship category in Syracuse, I knew that it was only the first happy step in a long road filled with challenges, failures, and wrong turns. But I also knew we were committed, focused, and bold enough to try to make a positive impact through social entrepreneurship. I know our team won’t stop until we’ve done just that. Learn more about Oasis Foods and experiential learning at Simon in WHAM 1180’s Eyes on the Future podcast from June 25, 2016, featuring Prof. Michael Wohl, Associate Dean David Tilson, Kat Cook, and Fahria Omar. Enter your email address to follow this blog and receive notifications of cool new posts by email.